Lactic Acid is the product of the fermentation made primarily by microbial activity. Its concentration is correlated to the total bacterial count. Therefore a chemical analysis for the determination of the concentration of lactic acid in beer is a useful indicator of the good storage of the beverage. Obviously a prompt and rapid control of this kind of parameter is more useful than ever. With CDR BeerLab® method you can carry out the analysis with a micro-quantity of sample in few minutes, obtaining reliable data. 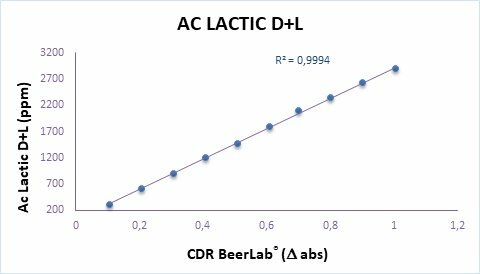 Lactic Acidi (D+ L) can be measured using CDR BeerLab®, a system which enables you to carry out a wide panel of chemical analyses on beer and water, using a single instrument, in a process that is faster and simpler than traditional methods. D-lactic acid and L-lactic acid are oxidized through an enzymatic reaction to pyruvic acid with the consequent production of NADH. The increase of absorbance, measured at 366 nm in end-point, is proportional to the lactic acid concentration of the sample. The result is expressed in ppM. Use on beer or wort. The beer sample needs to be degassed (we recommend to use an ultrasonic bath) before taking the sample. For higher accuracy in the analysis of wort we recommend to centrifuge the sample. Lactic Acid (D + L) was last modified: February 19th, 2019 by CDR s.r.l.